· Inflation drivers are much stronger in DM than in EM. The year-end forecasting flurry tends to focus more on the outlook for growth than the outlook for inflation. As noted in previous posts, growth has consistently tended to fall short of consensus forecasts for the past few years, a phenomenon referred to as “the optimism bias”. What is less remarked upon is that global inflation has also fallen short of expectations. This has occurred in spite of unprecedented efforts by central banks – in the form of negative real interest rates and massive Quantitative Easing – to fight disinflation. 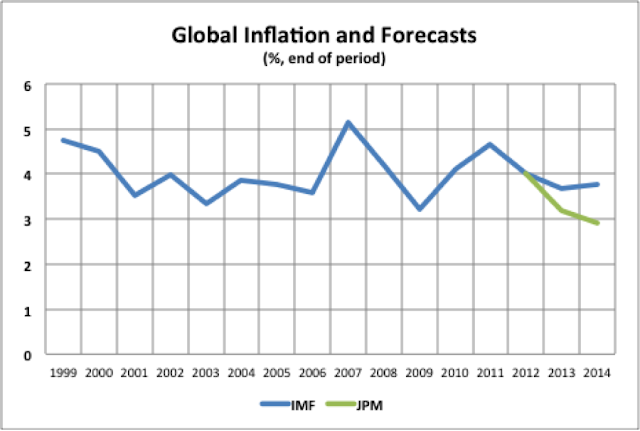 Last year, global inflation was expected by the IMF to ease from 4.0% at the end of 2012 to 3.7% in 2013 and 3.5% in 2014. This year, the IMF has lifted its year-end 2014 forecast to 3.8%. Meanwhile, a year ago, JP Morgan economists expected global inflation to fall to 3.2% in 2013; it is now estimated to have dropped to just 2.8%. 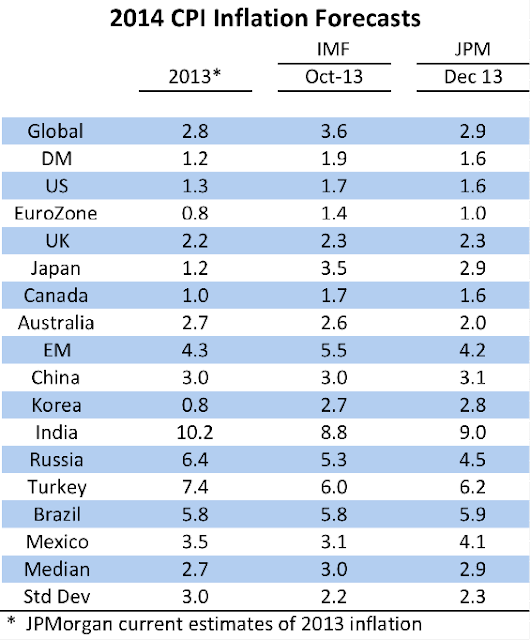 JPM's 2014 global inflation forecast is now 2.9%, which appears to be the lowest on record. It seems a little odd that, despite maintaining their perennial growth optimism, economists continue to downgrade their inflation forecasts. Unemployment rates have fallen in DM economies despite tepid growth, suggesting that estimates of potential (or trend) growth have been too high and that these economies are closer to full capacity than perceived. Yet in many countries, inflation is expected to remain low or to continue to fall. With the global economy building some momentum going into 2014, and with the lagged effects of massive monetary policy accommodation still in the pipeline, it seems very possible that inflation could be higher in 2014 than the record low forecast. Inflation in Developed Market (DM) economies hit rock bottom in 2013, coming in at just 1.2%, according to JP Morgan’s latest estimate, undershooting forecasts made a year ago by JPM (1.4%) and the IMF (1.7%). 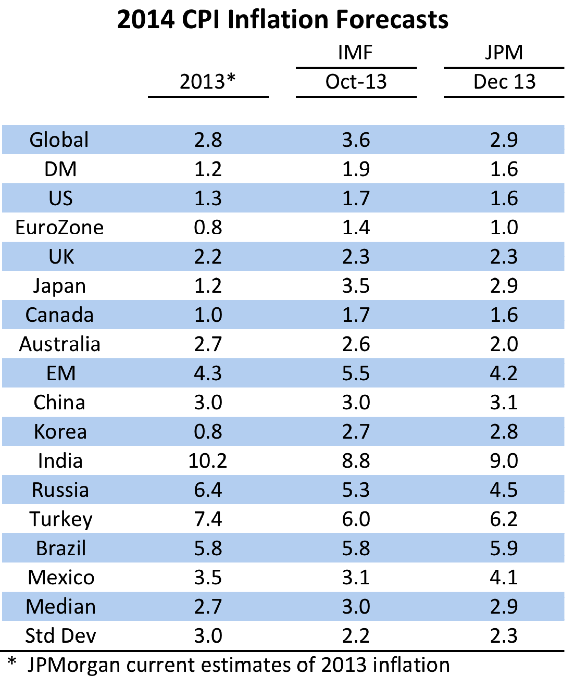 In 2014, JPM expects DM inflation to edge up to 1.6%. The IMF estimate, reflecting a slightly broader definition of which economies qualify as DM, is for inflation to rise from 1.7% in 2013 to 1.9% in 2014. Inflation in Emerging Market (EM) economies fell to 4.3% according to JPM’s estimate, undershooting its forecast made a year ago 0f 4.9%. In 2014, JPM expects EM inflation to continue to fall to 4.2%, while the IMF estimate (for a broader group of countries) is for a decline from 6.0% in 2013 to 5.5% in 2014. It seems strange that DM economies are widely perceived to have a large amount of spare capacity (i.e., large negative output gaps) and EM economies are perceived be operating above full capacity (i.e. positive output gaps), but inflation is expected to rise in DM economies and to fall in EM economies. The prevailing forecasts seem to run counter to the widely accepted aggregate supply versus aggregate demand framework employed by most central banks and private sector economists. In reality, the balance between aggregate supply and aggregate demand is only one driver of inflation and often is not the most influential factor. The concept of an economy’s domestic capacity (or output gap) is of declining importance in world of globalized supply chains. The chart below shows my rough estimates of several inflation drivers or impulses in the major economies. They combine the effects of current and prospective growth relative to trend, recent short term inflation momentum, the degree of stimulus supplied by the real central bank (CB) rate, and the effect of recent and prospective movements in the foreign exchange (FX) rate. Before going further, I would caution that I have normalized and weighted the contributions from the various drivers in a consistent but subjective fashion that accords with my judgment. The scale of the chart has less meaning that the direction of the impact of each of the drivers for the individual countries. Given the preceding caveat, the chart suggests to me that the largest upward push on inflation in the DM economies is occurring in Japan. With “Abenomics” in full swing and having as one of its targets raising the inflation rate to 2%, this should not be surprising. While short-term inflation momentum is still weak, growth is running above trend, monetary policy is enormously stimulative, and exchange rate depreciation has been substantial and is expected to continue. The UK economy also has relatively strong inflation impulses, with above-trend growth and the negative real CB policy rate making notable contributions. In the US, exchange rate appreciation is containing inflation, but other drivers are positive. 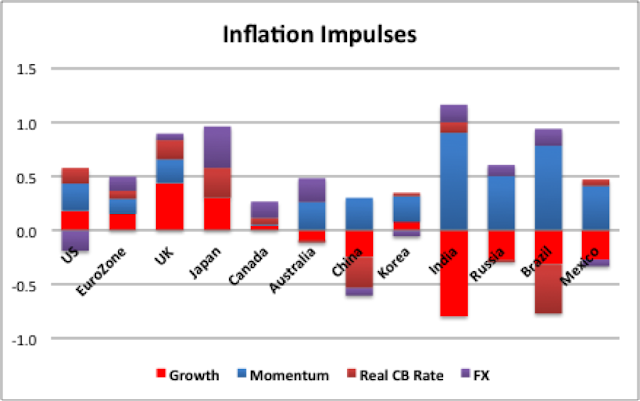 In contrast, Canada has relatively weak inflation drivers, with growth around trend, low inflation momentum, a higher real CB rate than other DM economies, and only a modest push from FX depreciation. Among the EM economies, inflation impulses seem strongest in India and Brazil. Growth is running well below trend in both economies, but short-term inflation momentum is strong, and past and prospective currency depreciation is adding further upward pressure. In Brazil, monetary tightening has pushed the real CB rate up to the highest among the countries in the chart but, so far, with little effect. Inflation drivers are much weaker in China, where below trend growth, a positive real central bank policy rate and steady, moderate currency appreciation are all acting to contain inflation. Barring a recession or another financial shock, it won’t be hard for global inflation to surpass the currently prevailing record low expectations for 2014. Upside surprises to growth and inflation in early 2014 could pose a significant risk to financial markets by the spring. Positive growth surprises could encourage the Fed to taper its QE purchases more quickly than currently anticipated. Higher than expected inflation would add a further negative for equity markets would put upward pressure on bond yields. The 2013 environment of disappointing global growth, lower- than-expected inflation and increasing monetary ease was an environment in which global equities and high yield debt outperformed other asset classes. Doesn’t it stand to reason that a 2014 environment of stronger-than-expected global growth and inflation and less monetary ease would likely reverse some of this outperformance?